Received May 7th, 2011; revised June 18th, 2011; accepted June 30th, 2011.
erage about 134 bo xes of LPOF to about 116 delivery points, once in two weeks period mainly during August-October. 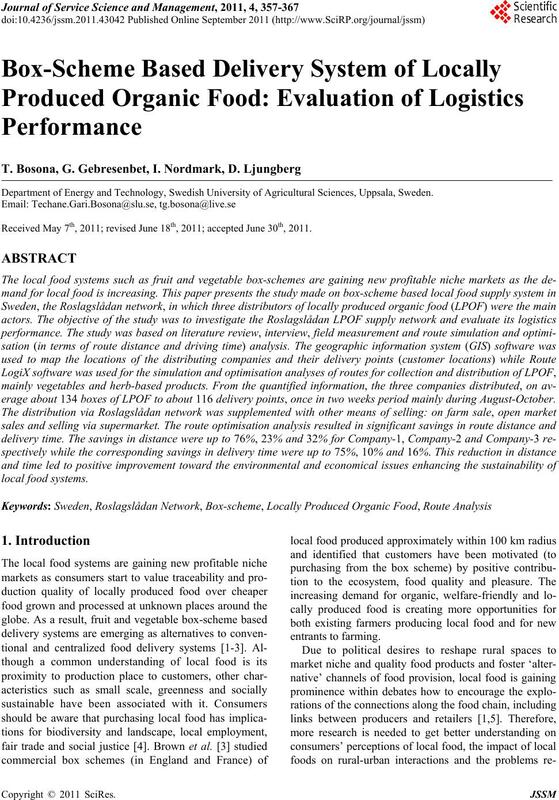 with large scale and conventional food supply systems. does not guarantee quality . logistics cost and to promote LPOF with high quality. Table 1. Product type and me ans of delivery. which are slaughtered and used for wool production locally. creased due to the network. Table 2. Characteristics of the existing distribution routes. 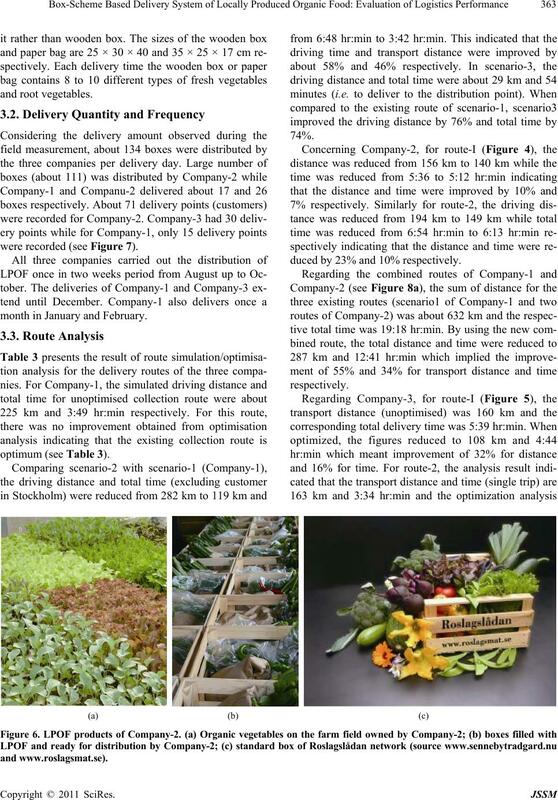 km) by each of its customers to collects the produce from distribution point (see Figure 3). delivered by Company-3 was performed via its route-II. were carried out in September and October months, 2009.
its three open fields and one green house (650 m2). Company-3 own farm land that covers about 20 hectares. from 1 km to 25 km. Figure 3. The current distribution system of Company-1. Figure 4. The current distribution system of Company-2. Figure 5. The current distribution system of Company-3. The producer distributes to its customers. is high in relation to driving distance and time. In this case, the company delivers to each customers. including and excluding the customer in Stockholm. place, from where its customers collect their order. order on the way from job or other trip. the products to all the customers of the two companies. tomer in Stockholm) and the two routes of Company-2. ues recorded for the routes. ered to be about 5 minutes. 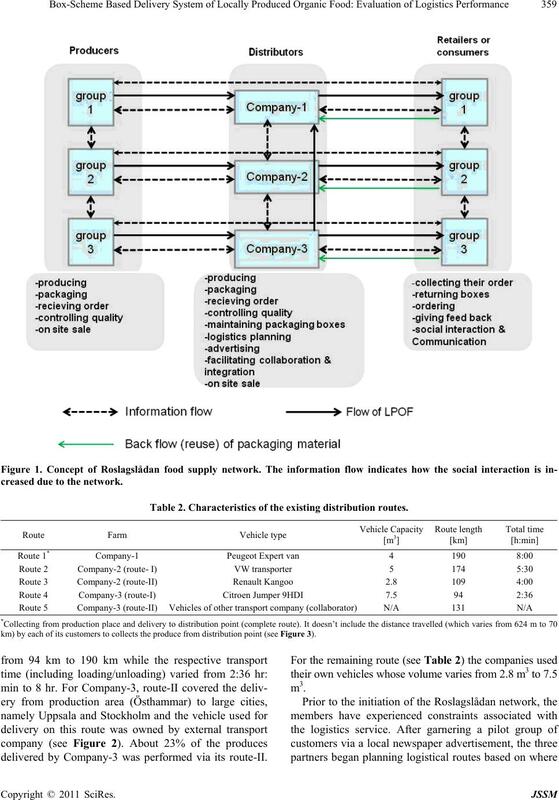 used as the standard packaging material (see Figure 6). were recorded (see Figure 7). month in January and February. duced by 23% and 10% respectively. 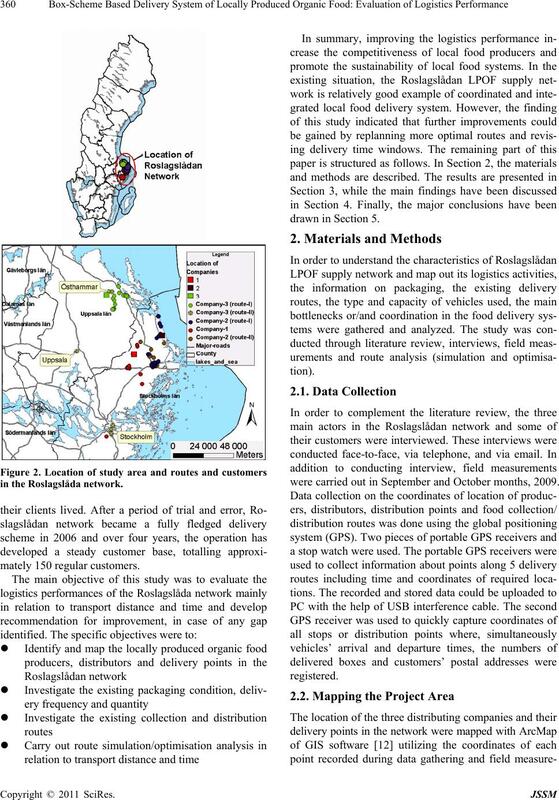 of delivery points recorded during field measurements. indicated that the existing route (route-2) is optimum. depending on the season and available produces. Table 3. 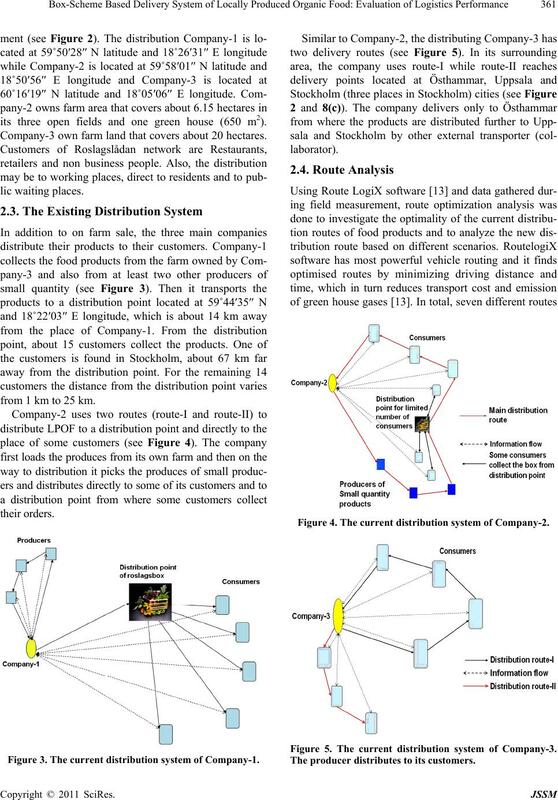 Summary of route analysis for product collection and distribution by the three companies. firmed the findings of previous researches [7,8]. 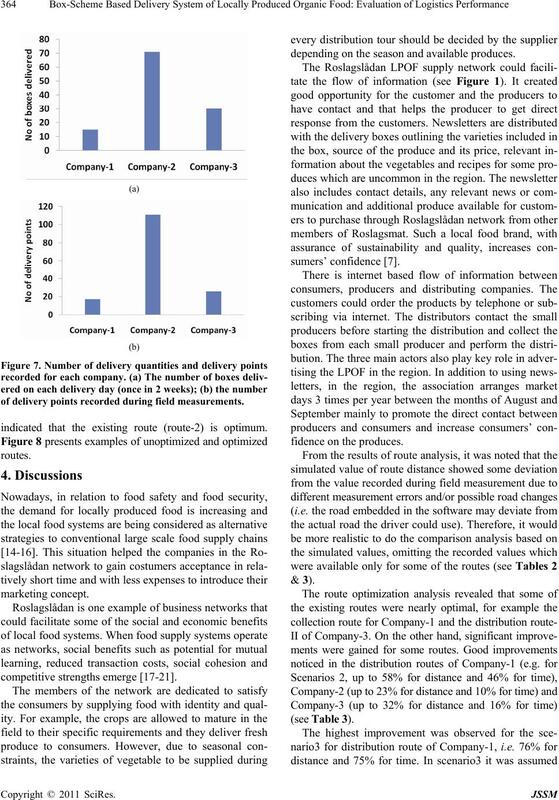 cussion between customers and distributing companies. been found to be the best. terms of route distance and driving time) analysis. 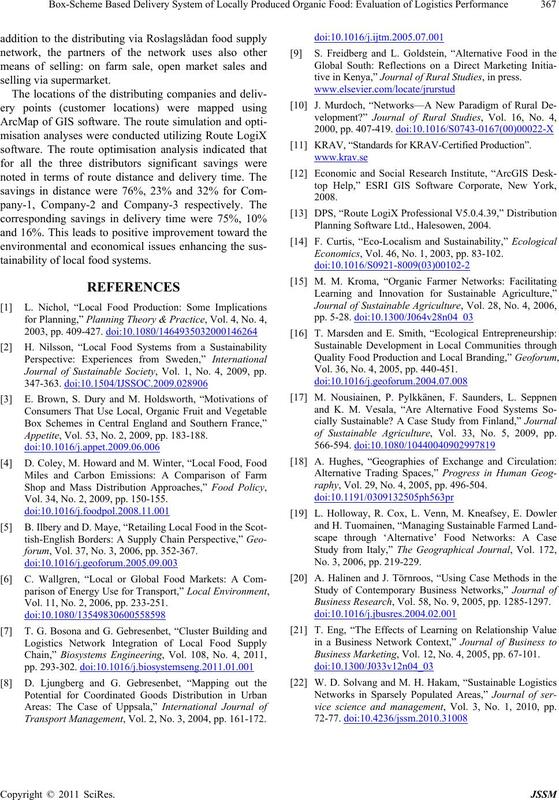 tainability of local food systems. Vol. 34, No. 2, 2009, pp. 150-155.
forum, Vol. 37, No. 3, 2006, pp. 352-367. Transport Management, Vol. 2, No. 3, 2004, pp. 161-172.
tive in Kenya,” Journal of Rural Studies, in press. KRAV, “Standards for KRAV-Certified Production”. Economics, Vol. 46, No. 1, 2003, pp. 83-102. Vol. 36, No. 4, 2005, pp. 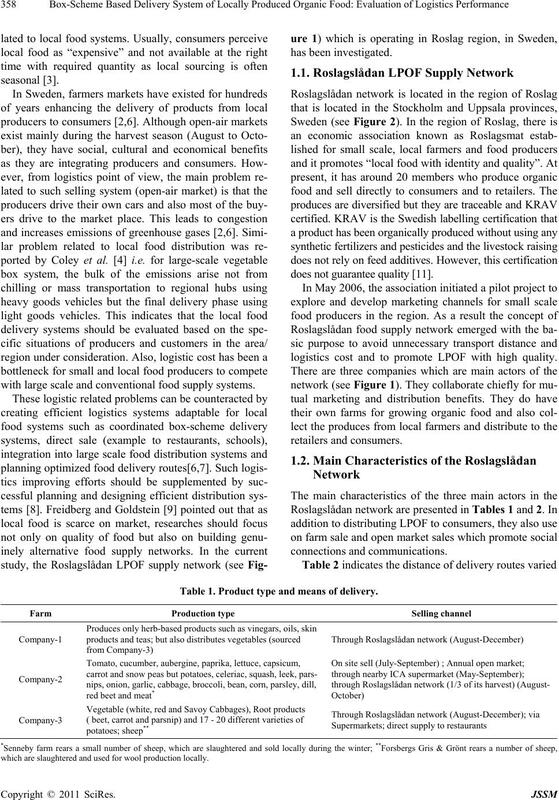 440-451.
of Sustainable Agriculture, Vol. 33, No. 5, 2009, pp. raphy, Vol. 29, No. 4, 2005, pp. 496-504. No. 3, 2006, pp. 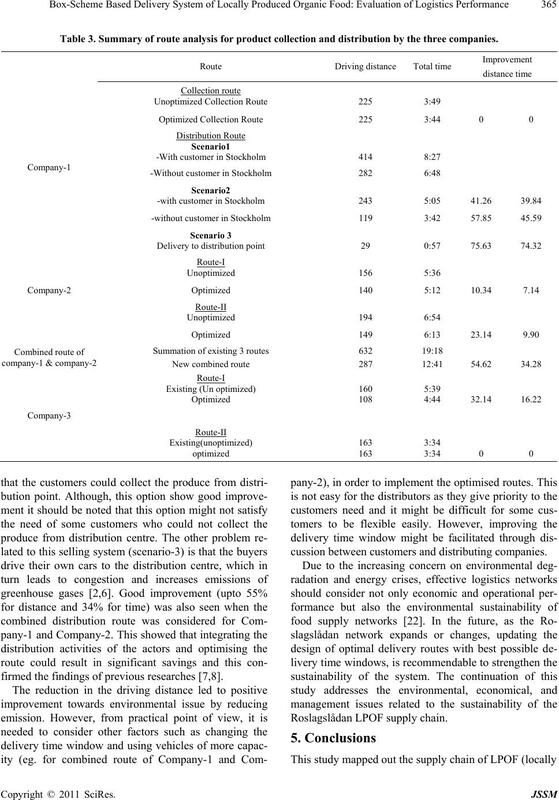 219-229.
Business Research, Vol. 58, No. 9, 2005, pp. 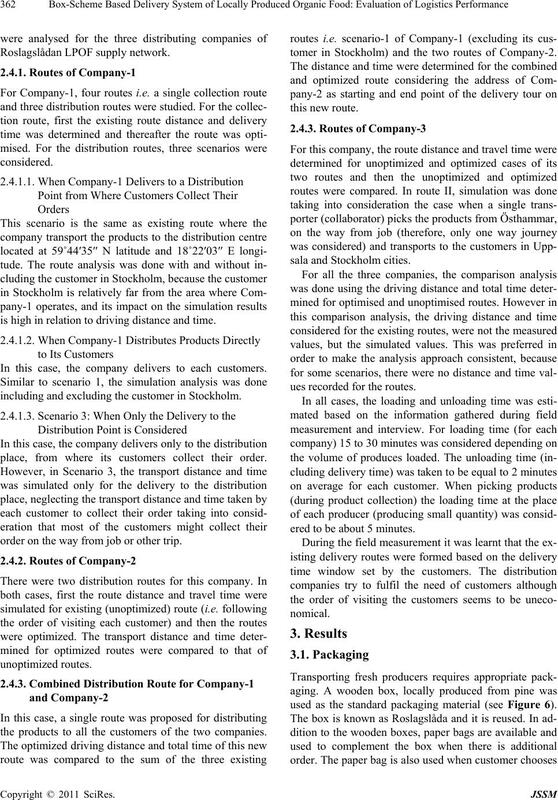 1285-1297.
Business Marketing, Vol. 12, No. 4, 2005, pp. 67-101.
vice science and management, Vol. 3, No. 1, 2010, pp.